Judy's Doll Shop | 2014 British Collectors Bear "Jubilee"
This teddy bear is made from the finest blonde mohair and is 20 inches tall..
For 25 years the Jewel in the crown of any Steiff collection has been the British Collectors Bear. 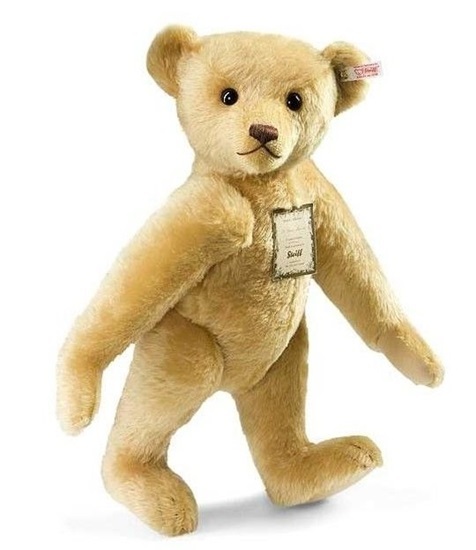 To celebrate this milestone Steiff went back to the first of these bears, released in 1989. A little smaller than the original, this fabulous bear still stands 20 inches tall. Jubilee Teddy Bear is made from the finest, smooth blond mohair. He has traditional long arms, with hand-stitched claws and stitched nose and mouth. He bears a growler in his tummy. Delivered in a Steiff box with numbered certificate of authenticity and bearing the Steiff gold-plated button in ear with special elephant motif for 2014 celebrating 110 years since the first button in ear. This teddy bear is a UK and Ireland limited edition of 1000.